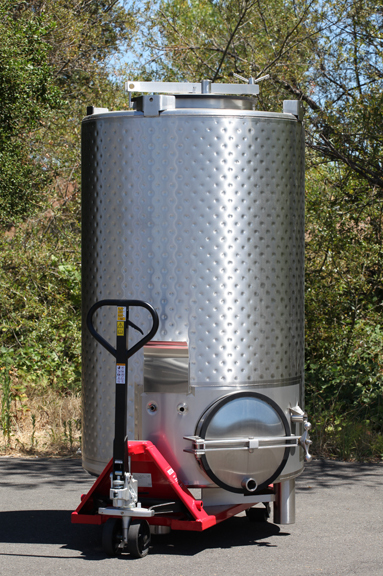 For more than thirty years, Westec has been building stainless wine tanks on-site in sizes that are too large or too heavy to be trucked, typically 60,000 to 250,000 gallons, and we can build smaller tanks on-site when needed. We will calculate the weight of the tank based on the gallonage you are considering, and will help develop the scope of work for permits. The tank above is nearly 160,000 gallons and 30' x' 30' dimensionally with double-wall insulation. Westec built it with an A-frame structure, then placed it using a crane to lift it a short distance over existing tanks. Experienced winemakers include liability planning with very large, site-built tank farms and they value Westec's engineering experience, properly trained crews, first-rate equipment and safety programs for field fabrications. Working with the winemaker, Westec calculates the A-frame rating required based on the gallonage. The beams are sized for the specific planned load. Our engineered A-frames are "wet-stamped" and Westec provides this information as part of the permit process and for liability coverage. Safety is Number One with Westec. Give us a call with your gallonage and site requirements and find out more about our fast field fabrication. Westec's trained, experienced crews set up an A-frame and a construction trailer on a flat building site at your winery. The tank top is created first, then then next section is placed below it so that the new tank is open at the bottom until the final stage so it is not considered a confined space. 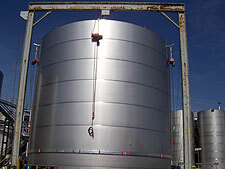 Westec repairs tanks by any manufacturer, in the field or in the winery. Give us a call to find out what we an do for you. These wine fermentation tanks are built with an eleven foot shell using both with six-foot and five-foot dimple jackets. A fully-dimple jacketed tank of this size has very wide usability and can be used for small tonnage grape yields or up to 14 tons, as needed. For high-volume blends and fermentation, large volume tanks are cost-efficient. 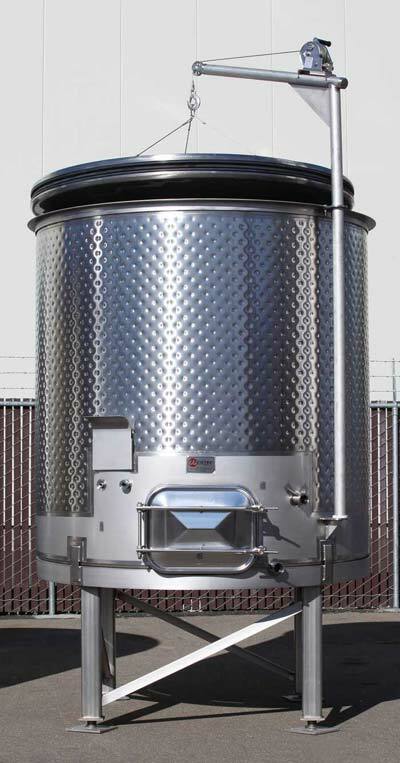 Westec builds stainless wine tanks to your specification, from the largest to the smallest portables. The variable capacity tank pictured has a "floating" lid which adjusts to the amount of wine in the tank. The edge of the top is then inflated to seal the tank. This style is ideal for small batch fermenting and specialized bottling. The variable capacity floating lid tank gives vintners storage flexibility when crop yields vary from year to year. Each tank is custom-built to your specifications. Jim Belli and Mark McDowell bring years of experience working with owners and vintners to their custom fabrication of tanks, catwalks and equipment. They can provide valuable input in planning tank sizes, tank farm layouts or tank and catwalk configurations. Innovative tank design is our specialty. Call us for valuable input on your tank and winery requirements. Westec is eager to put our experience to work for you. Westec's experience helped us design our facility with fresh ideas. Their craftsmanship is impeccable, they deliver on time and I like working with them."